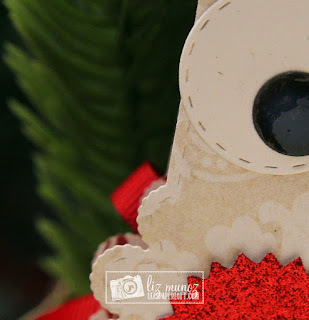 Liz's Paper Loft: MCT 5 Days of Christmas ~ reindeer! GOOD MORNING my friends! Today is Day 2 of My Creative Time 5 Days of Christmas. This week my Design Team Sisters at My Creative Time are working on a treat this week for our “5 Day s of Christmas”. You will see tons of AMAZING ideas from tags, treats, cards, gift card holders, etc.... to get your holidays off to a “crafty” good start! We all hope you enjoy everything you will see this week! 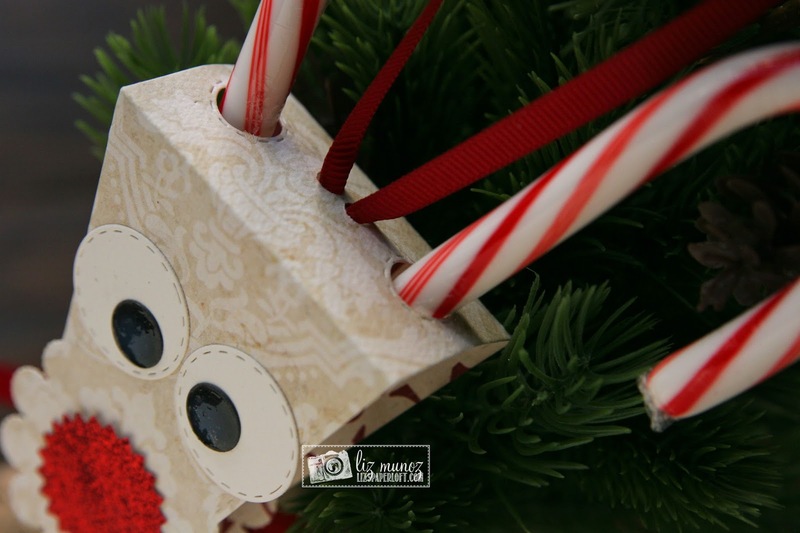 Today's project is a fun ornament that could be made by a group of kids. This reindeer ornament took hardly anytime at all to make. Hope you enjoyed the week! OMG Miss Liz WOW what a Super Cute idea...and must say I'm in awe with what you used to achieve your clever and oh so creative idea...definitely a winner.....I love it and it sure look cute hanging on the tree...what a brilliant idea and then the candy canes antlers. & I too love your idea for the nose..gosh wha kid wouldn't love getting this from 1 to 100!! I love it!! Definitely a Super Outstanding Creative job!!! YOU so ROCK!! OMG!! That is so cute!! great idea turning the lollipop holder upside down! Such a clever idea-love the reindeer! This is so clever and adorable, Liz! What a great idea!!! Eek! This is soooo brilliant! My grandkids would love this!! Oh my goodness! How adorable!! I love this!! What a clever idea! Super fun Liz! OMGOSH! That is so DANG CUTE! LOVE, LOVE that sweet reindeer treat! Very cute and clever way to make a reindeer. 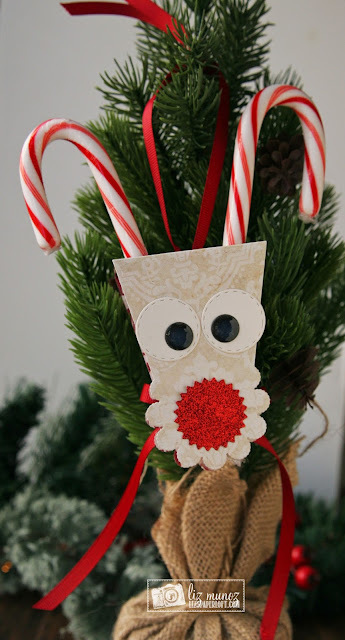 Cute ornament idea! These would be fun to make! Love the candy cane antlers! What a neat idea! So clever! 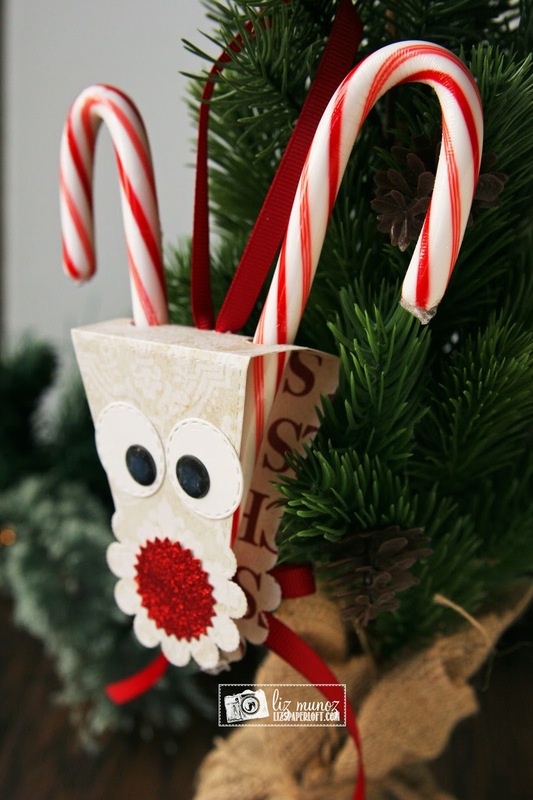 The reindeer is adorable with it's candy cane antlers! Oh how are adorable and says reindeer, love it! Ms. Liz, what a neat and cute idea, who would have ever thought of this. Thanks for all of your ideas. I love how you used the lollipop treat holder to create this adorable ornament! So very cute! Your ornament is adorable! So clever to use the lolly holder for a head...love the nose and eyes. Wonderful job.